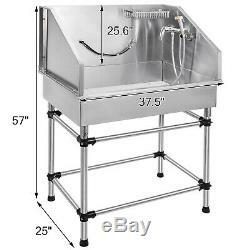 38 Stainless Steel Pet Bath Tub with Faucet For Small-Medium Pet. This professional pet bath tub is an ideal solution for the grooming of small-medium pets. Each tub's size, features, and accessories make bathing an easier, time-saving affair. 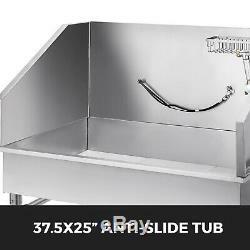 Made of 304 resistant stainless steel, the tub can supports pets up to 180 pounds. Back-splash and side-splashes can be removed for greater versatility and feature waterproof seals when it is assembled for normal use. 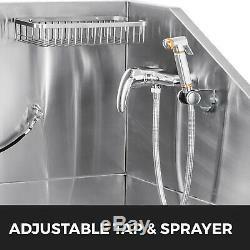 Adjustable tap and sprayer with cold and hot water hose are convenient to use. Tub legs are manufactured at a perfect height to reduce groomer back pain and the anti-slide design in the bottom of tube can prevent pets from slipping. Useful accessories are included with mini-tub, allowing for maximum efficiency without the added mess. Tub comes with a top-of-the-line sprayer, a faucet, a cold-hot water pipe, a handy rack to hold grooming products, and more. Tub does not come fully assembled. 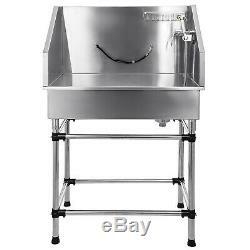 Dimensions: 38"L x 26"W x 38 H. 304 stainless steel body durable, stable, anti-corrosion, anti-fatigue. Anti slide design in the bottom of bath tube can prevent pets from slipping. Right Drain works with any plumbing configuration. Steady stands and floor pads, removable drain hole, stainless steel shampoo rack, fixing ropes and one red play ball. 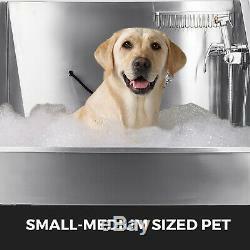 The pet bath tub is an ideal solution for the groomage of small-medium pets. 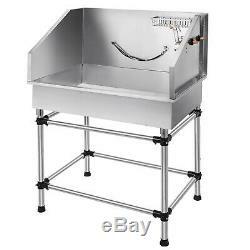 Made of 304 stainless steel which provides great sealing, solid durability, and easy maintenance. Right Drain works with any plumbing configuration, and come with Leg Levelers to adjust height. Adjustable tap and sprayer with cold and hot water hose is convenient to use, sprayer with chromium coating and brass core is durable and anti-rust. 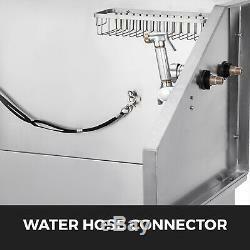 Water Drain Hole & Hose &Shampoo Rack. 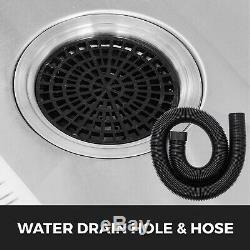 The removable drain hole is easy to clean, PVC hose. Stainless steel shampoo Rack for easy storing. Stands & Floor Pads & Fixing rope. 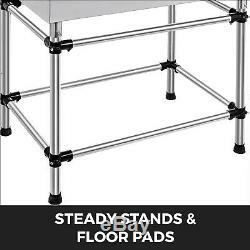 Steady stands and floor pads can prevent scratches on the ground. And pets can be securely fastened with the fixing rop. Bath Tub Material: 304 Stainless steel. 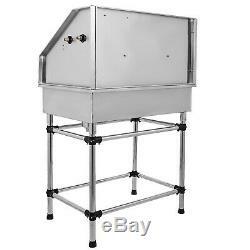 Dimensions: 38"L x 26"W x 38H /965 x 660 x 965 mm. Packing size: 42 x 30 x 20 /1060 x 760 x 500 mm. 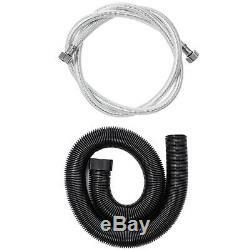 1 x Hot and Cold Water Hoses. 1 x Stainless Steel Shampoo Rack. 1 x Red Play Ball. As a leading and emerging company in manufactory and exporting business, we are specialized in Business and Industrial Products, Sporting Goods, Pet Products, Home and Garden products for more than 10 years. Please contact our customer service before you return an item. 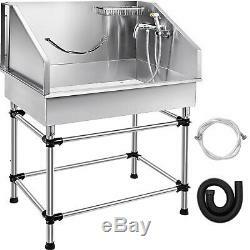 The item "38 Stainless Steel Pet Bath Tub WithFaucet Professional Heavy Duty pet Grooming" is in sale since Tuesday, March 26, 2019. This item is in the category "Pet Supplies\Dog Supplies\Grooming\Shampooing & Washing". The seller is "greatfunctionitem" and is located in Ontario, California.